A smaller option than the original Soapy Soles, this spa quality foot washer is perfect for smaller feet, tighter spaces, travel, or anyone that would prefer a slightly smaller model. This handy little device allows you to quickly clean your feet without bending over. It will deep clean in just seconds and it massages as it washes. Your feet will be left incredibly clean and feeling great. Simply place it on your bath or shower floor and several high quality suction cups will keep it right in place. Add a bit of your favorite soap and proceed to scrub those dogs. No more risk of slipping and falling and no more bending and straining. Great for travelers, gardeners, kids, beach-goers, athletes, people who work on their feet, those with limited mobility, and everyone else who loves bare-footed fun. It is a foot-shaped pad that suctions to your tub or shower floor to provide a soft bristled surface for cleaning and invigorating your feet. 1000 little fingers massage your feet, deep cleaning and removing dirt with a quick and effective action. Your feet will be left incredibly clean and invigorated in very little time, and without any bending or struggling. A thick lather will build up quickly to thoroughly cleanse your feet with ease. This great scrubber does all the work so your don't have to. It all but eliminates awkward bending & balancing while in the shower, and is a refreshing treat for tired feet. The American Podiatric Medical Association recommends washing feet regularly, especially between the toes, to keep feet healthy. For those with circulatory disorders or who have trouble bending over, keeping feet clean can be a real challenge. Soapy Toes is perfect for these people, and for the rest of us, it can save time and allow us to benefit from the therapeutic massage and the resulting, super clean feet. It's great for camp or beach showers too. Soapy Toes will make it easy to clean really dirty feet, and easily removes sand, mud, caked on dirt and more. Stop hopping on one foot to wash the other. 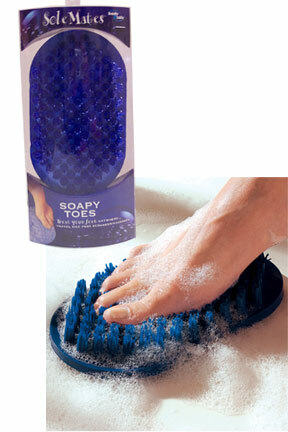 Clean your feet the easy way with this great product. Soapy Toes makes a great addition to any tub or shower. Get Yours Today! Dimensions (l x w x h) 7.25" x 4.25" x 1.25"
Soapy Toes Foot Washer - Clean your feet without bending over. Get professional results with very little effort. Great for the elderly, people with arthritis, folks with disabilities, children, those with really dirty feet and more.Order Today! I tried this product because I have trouble bending, I thought it was just what I needed. This product made my feet scaly and very tender: it may be from the latex in the material or something. As I stated this is a good product, just not for me. I'm happy I found this online. Perfect for me! Soapy Toes works great! Just slather some liquid soap on it and rub your feet across the bristles. Viola! Clean feet!